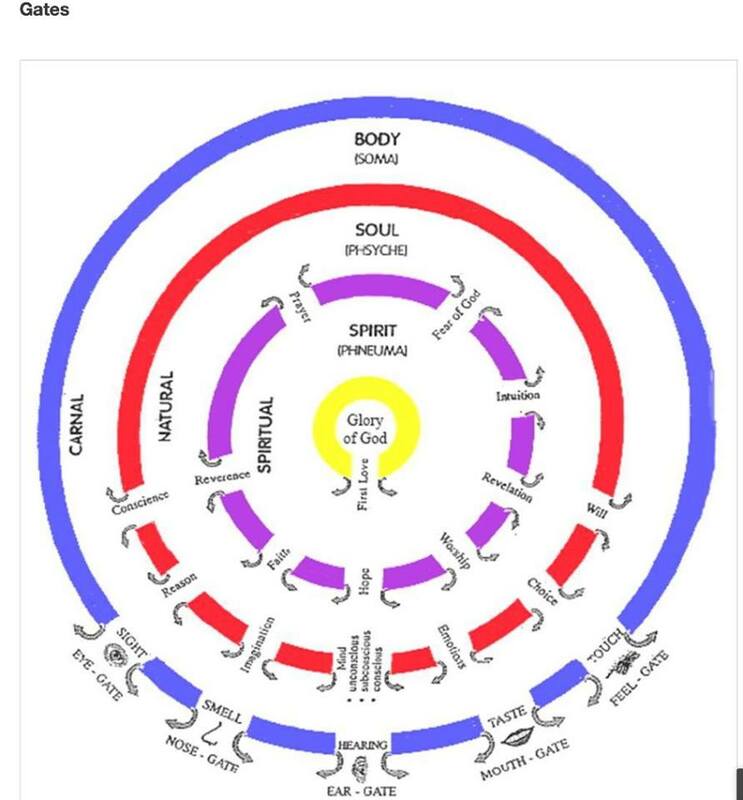 Is there a diagrammatic representation of soul, spirit, heart and their components based on the tripartite view of man? I understand there can be overlapping but I'd like to know if there is a visual representation (may be like set diagram) that relates 'heart' to the other components. Similarly, what other pieces can fit the description of heart and how do they exist in the context of spirit and soul? According to the tripartite perspective, when the scripture says 'heart' does it include the whole spirit and soul? Or does it include some parts of spirit and soul? For example, in verses such as Matt 15: 19, Mark 7:21, and Heb 4:12, thoughts (generally related to 'soul') are also part of 'heart'. If, however, I were to diagram your three highly abstract words, I'd probably draw a heart; you know, the typical Valentine's Day heart, which is probably recognized universally (at least in literate cultures) as a symbol for heart. I'd then draw a straight line down the middle of the heart, from the indented part at the top, to the rounded part, below. I'll explain the diagram later in my answer. Let's start with the word heart. The word heart, of course, can be defined both literally and figuratively, with a good deal of overlap between the two, since with virtually all metaphors, separating the figurative from the literal is very tricky indeed! Allow me to ensconce the word heart in a sentence, which I'll use as a springboard for this section of my answer. If I am correct, the word, as ensconced, will have, potentially, great heuristic value. "I can just tell that Jim's heart isn't in the project." So let's say Jim works in the R & D Department of the ACME Mousetrap Company. His department has been charged with "building a better mousetrap," and Jim is heading up the project. Jim has an assistant working with him as liaison between him and all the department heads within the company. The above quotation came from Jim's assistant. How and why, do you think, Jim's assistant arrived at the conclusion which I've summarized in the words, "I can just tell that Jim's heart isn't in the project"? "Jim shows a lack of enthusiasm for the project. Period." In other words, when someone does not put his or heart into a project, he or she will evince a lack of enthusiasm in attitude. Nonverbal clues alone will clue everyone in that Jim is not a happy camper! Put differently, your heart involves your entire person--intellect, emotion, and will (or spirit, soul, and body). "and hope does not disappoint, because the love of God has been poured out within our hearts through the Holy Spirit who was given to us (Romans 5:5 NAS). No wonder the world (in the Johannine sense, as in 1 John chapter 2) links the romantic aspect of heart with the word love! And rightly it should, minus the worldly aspects of course! "Set your affection on things above, not on things on the earth" (Colossians 3:2 KJV). Again, to set one's affection on "things above" requires a commitment of the entire person: intellect, emotion, and will. "I can just tell that Jim is dis-spirited about having to head up the project." In biblical terms, however, when we think of spirit, we need to think of the God-awareness in each of us, particularly Christians. "For the mind set on the flesh is death, but the mind set on the Spirit is life and peace, because the mind set on the flesh is hostile toward God; for it does not subject itself to the law of God, for it is not even able to do so, and those who are in the flesh cannot please God. However, you are not in the flesh but in the Spirit . . ." (8:6-9a NASB). I suggest that in these verses Paul equates spirit with mind, even though he does not use the word spirit with a lowercase S. Christians relate to the Spirit--with an uppercase S--with our spirit--with a lowercase S. Furthermore, mind and spirit are two words which frequently denote the same thing; namely, the symbol-mediated (i.e., language-mediated) thought process which fills virtually every waking (and perhaps sleeping) moment of our lives. That process can be both inner-directed and outer-directed, as we relate to ourselves intra-personally, and to others interpersonally, whether in the silence of our word-mediated thoughts or in verbal and/or nonverbal (including sign language) exchanges with others. When that thought process is directed heavenward, as it were, and toward God, we engage our spirits in communication with the Almighty, through our Lord and Savior, Jesus Christ. ". . . sharper than any two-edged sword, and piercing as far as the division of soul and spirit, of both joints and marrow, and able to judge the thoughts and intentions of the heart" (Hebrews 4:12 NASB, my emphasis). Interestingly, the writer to the Hebrews tells us God's word targets the division between soul and spirit. Why? I suggest that soul is that part of the inward process I described above which starts as primarily self-directed and self-motivated thought or ideation, and then is externalized and primarily conscious behavior: I think, therefore I am, therefore I act. "I am crucified with Christ: nevertheless I live; yet not I, but Christ liveth in me: and the life which I now live in the flesh I live by the faith of the Son of God, who loved me, and gave himself for me,"
we realize Christ does not desire to take over our identity, personality, and temperament; rather, he wants these things to take on the character of Jesus, and to do so in His strength, not ours. "Now the works of the flesh are evident, which are: adultery, fornication, uncleanness, lewdness, idolatry, sorcery, hatred, contentions, jealousies, outbursts of wrath, selfish ambitions, dissensions, heresies, envy, murders, drunkenness, revelries, and the like; of which I tell you beforehand, just as I also told you in time past, that those who practice such things will not inherit the kingdom of God" (vv.19-21). "'But the things that proceed out of the mouth come from the heart, and those defile the man. For out of the heart come evil thoughts, sexual immorality, murders, adultery, greed, theft, malice, false testimony, slander, lewdness, envy, deceit, arrogance, and folly'" (v.19 and vv.21-22, respectively, NIV). "Marriage is to be held in honor among all, and the marriage bed is to be undefiled; for fornicators and adulterers God will judge" (13:4 NAS). By doing all the above (and the list is only partial), as the Spirit takes God's word and applies it to the soul-ish, self-conscious part of us, we are sanctified progressively as our minds and behavior patterns are transformed (see Romans 12:2). The result is an increased conformity to the image of Christ (see Romans 8:29). Back to my diagram. If I were more computer savvy, I'd cut and paste something as a visual aid for you. Unfortunately, however, I'm not that computer savvy. In lieu of a visual aid, then, picture a typical, stylized heart, which represents the invisible aspect of personhood, which for our purposes consists of an admixture of spirit and soul. The physical body is, as it were, the agent of, or vehicle for, the spirit and/or soul. 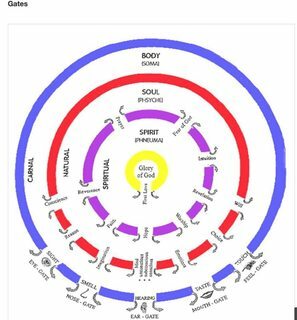 In a biblical hierarchy of values, however, the spirit as a sanctified mind must always trump the soul, particularly when the soul wants to use the body, via the mind/body nexus, as a vehicle for gratifying the desires of the flesh. "Casting down imaginations, and every high thing that exalteth itself against the knowledge of God, and bringing into captivity every thought to the obedience of Christ . . ." (2 Corinthians 10:5 KJV, my emphasis). The soul is your entire essence. In programming it would be your object. Your body is the physical representation of your object. Your mind would be similar to dynamically linking libraries of functions and user input. Your heart is like the user, making the decisions based on desires leveled by importance. The spirit is your attitude layer (detailed explaination) and is controlled by Faith and Denial. Faith describes "Faith in God repairing the threatening behavior". Denial describes "Faith in the flesh repairing the threatening behavior or completing the Mosaic Laws of Opposite Equal Reactions". The Spirit Layer is similar to a Select Case If/Then Run-time. ...Apparent as the psychological Stages of Grief. Not the answer you're looking for? Browse other questions tagged nature-of-man souls tripartite or ask your own question.